Our Baked Sunday Mornings recipe this week was the infamous Black & White Cookie. Which I always thought was a cookie but is actually a small cake. 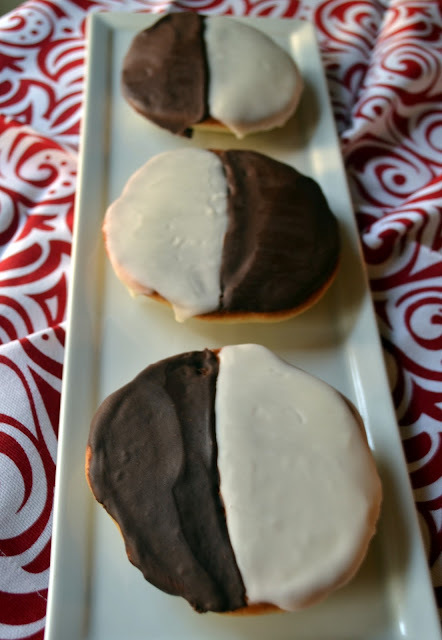 Black and White Cookies always make me think of the episode of 'Seinfeld' where Jerry sees a black and white cookie in a bakery and says, "Two races of flavor living side by side in harmony. It's a wonderful thing, isn't it?" Wise words, especially after this week of unbelievable violence. I enjoyed making these cookies. Everything comes together easily and I enjoyed the process of frosting them. I wished my cookies had come out more round, but none of my three cookies scoops were the right size so most of mine were ovalish. This was my first time trying this cookie and it was quite tasty. Nothing that will knock your socks off, but a solid treat with simple flavors. And sometimes simplicity is best, right? To get this recipe, please visit Baked Sunday Mornings. I always thought they were cookies too, so I was surprised with the cakeyness of them. And I'm with you on the Seinfeld! Too funny. Love how you displayed them. You are right, quite a simple cookie, but for me, it was solid win! I remember the first time I ate one, and I was so surprised at how they're more like a cake than a cookie! I like that yours aren't perfectly round - it's charming! Looks yummy! I still haven't had one and was also surprised that everyone said they're supposed to be cakey instead of something like a sugar cookie! My husband loves these! When Fresh Market first opened, they had huge ones that I like to think they actually made in the store. Now they're about half the size (same price) and they come prepackaged and frozen. So sad! I've made them several times but they are somewhat of a labor of love. Yours look tasty. I'm off to check out this recipe to see if it's different than the ones I've tried. I always wanted to make black and whites and I never did. Perhaps, the time has come.